Wayne F. Edinger “Wild Wayne”, age 85, died peacefully on Nov 3, 2018 with his family at his side. He was born to Fred “Fritz” and Gertrude (Fraser) Edinger on June 11, 1933 and from birth, he never slowed down. 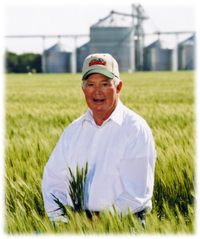 Wayne always dreamed of being a farmer, but before he entered the farming profession full time, he attended Kansas State University and Dakota Wesleyan University, graduating from DWU with a degree in Biology. He then spent two years in the Army as a Medical Corpsman, stationed in Fairbanks, Alaska. After the Army, he obtained a BS in Education from Whittier College in southern California. It was there he met his wife Janet “Sue” Ellithorpe and they married June 9, 1962. Wayne taught for the Montebello School District in Los Angeles, California from 1961 until 1990, where he was either a full-time teacher and farmed in the summer, or a full-time farmer and part-time teacher. In fact, Wayne had such a passion for farming and was so beloved by his students, that many of his former students visited White Lake to experience the farm life in action. What really set Wayne apart was his knack for progressive farming and passion to feed the world. He was a motivated farmer who proved he could be different and successful by raising only crops, beginning in the late 1950’s. Always wanting to improve, he was an early advocate of no-till farming and use of technology in the field. Wayne set the stage for his sons, encouraging them to make management decisions at an early age, which allowed them to grow the operation they continue to this day. When Wayne met new people, he proudly informed him that he was a farmer, and shared the impact that farmers had on the globe. Wayne had an active mind, always asking questions and seeking knowledge. He was an avid reader and loved to hunt and travel. Patriotism ran even deeper through his veins on July 4 celebrations or when listening to patriotic music. There could be no better father who balanced teaching, discipline and fun in raising his children. Wayne challenged his kids and instilled the value of hard work and payoffs in life. His mantra was work hard, then play hard. He was always there for Chet, Charlie and Alice, whether attending every track meet in which they participated or providing farm advice when needed. Nearing retirement, Wayne and Sue continued their education by attending Clown School in Florida. After graduation “Wild Wayne” and “Susie Q” spent countless hours volunteering and raising money for local charities and Give Kids the World in Florida. He loved to entertain crowds with his exceptional ability to lighten the mood with his banjo, harmonica, horn and balloon animals. Keeping a good attitude and sense of humor until the end, Wayne joins his loved ones in heaven; his son, Owen, and parents, Fritz and Gertrude. He leaves behind his wife, Sue, son, Chet and wife Jackie, son, Charlie and wife Darla, who all reside in Mitchell, a daughter, Alice and husband Keith in Hong Kong, sister, Gayle Harmon in Mesa, AZ, ten grandchildren and four great-grandchildren, as well as numerous nieces and nephews. A visitation will be held on Friday evening, Nov 9th from 5pm – 8pm, with a prayer service at 7pm. at the First United Methodist Church in Mitchell. At the end of the prayer service, stories can be shared. A Celebration of Life will be Saturday, Nov 10th, 10:30am at the White Lake United Methodist Church. In lieu of flowers, donations are requested to the Wayne F Edinger Scholarship Fund at Mitchell H.S and MTI or the White Lake Community Grant. Wayne leaves a myriad of memories, quotes and life lessons with friends and family – and a strong legacy of philanthropy supporting youth, their education and other causes.